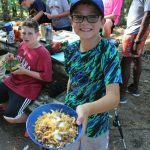 Campfire programs are a special part of camp programs and we love this opportunity to get our campers together for these great events. 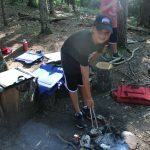 We have a wide variety of campfire programs. These happen once a week and are either village campfires or all-camp campfires. 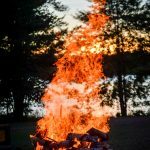 During village campfires, each of the three villages has their own separate gathering where everyone participates in traditional North Star games like beach flags, and talking contests. 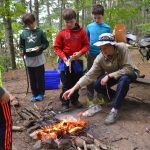 These programs may also involve campers and staff singing songs and playing instruments and someone telling a great campfire story. Of course, the evening isn’t complete without roasting marshmallows. 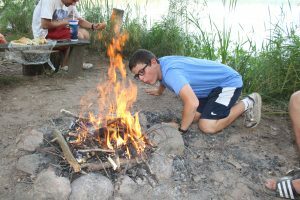 We also have weekly cabin campfires each Sunday. Cabins get together and digest the events of the week. The boys have the opportunity to talk about how they have grown the past week as well as set new goals for the week ahead. Speaking about their growth allows the campers to see how far they have come at camp and continue to make the most out of their summer.